This week I decided to go back to my own childhood and try a crayon resist. It is easy and fun. Something to etch the picture – a pen that doesn’t work is great, a bread and butter knife. I used the end of one of my watercolour brushes. 1. Using crayons colour all over the cardboard. You can do straight lines of colour, circles, random (this is what I did), a pattern – it doesn’t matter. 2. Go over your picture again with the crayons to be sure you have it as filled as possible – press hard. 3. Using a large paint brush apply the paint to the whole picture. 4. Make sure the paint is perfectly dry. Use a hair dryer if you can’t wait. Etch your picture and watch the colours appear. Put down newspaper because when you etch it will make a mess. You can etch as much as you want. The more you clear the black the more colour will show through. I had lots of fun making a Crayon Resist Tadeo Turtle. Try it with different pictures – Butterflies, children, family, any picture will work. 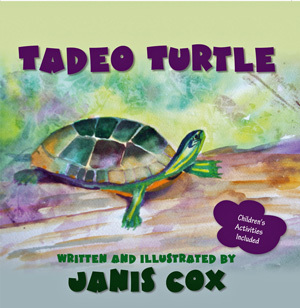 If you want to purchase a signed copy of Tadeo Turtle click on Paypal. This entry was posted in Prayer and tagged activity for kids, crafts, Crafts, crayon resist, crayons, fun, Janis Cox, paint on June 8, 2013 by JanisCox. Hey there! Thanks for linking up your cute project. Stop by again next week and link up another awesome project! That is a wonderful craft, Janis. My kids will LOVE this! Hi, Janis! Thanks so much for stopping by The Magnolia Barn. I love this adorable craft…just pinned! You are so talented and I’ve enjoyed browsing around your blog. Have a great weekend! Thanks for visiting and following Living and Learning With Our New Normal. I remember making these scratch off drawings when I was little! It was a pleasure to visit your blog. Continuing to pray for a good decision. So cool! Somehow I missed this in school, and it looks like a lot of fun. I may have to go buy some paint. You’re going to have quiet the turtle art collection very soon! Go buy the paint – it such a fun, amazing activity. I loved seeing the colours coming through as I scratched the black. It did feel amazing.